Terrific review, my experience with this knife to an absolute tee. It’s just too heavy to lug around regularly and mine has the exact same blade play issue you mentioned. While it’s not awful it’s definitely not very reassuring. I could definitely see having it in my center console as a back-up or something but nowadays there are just so many better, lighter options out there. That’s basically the fate I’ve relegated my 110 to: it sits on my desk in case I need a knife and can’t find any of my other knives. It’s funny, I’ve never been obsessed with lightweight gear, but I guess my breaking point is somewhere around the 7 oz. mark. Crazy to think that the Crooked River (a clear tribute to the 110) is almost 2 oz. lighter, with the same blade size and a larger overall profile. It’s easy to forget how amazing modern materials like G-10 or titanium are. In some ways this was the hardest review period for me. I couldn’t wait to get something lighter into my pocket. Same here. I carried one when I was a kid and let it get away from me at some point so I recently bought another one and carry it on my belt everyday. I’ve got a few fixed blade knives I’ve tried to carry daily in various sheaths like the Esse 3 and Becker 14 but the Buck 110 in its belt sheath suits me better. Yes, the old Buck 110 is still an Icon! I have a few old 110’s, and that old medal still comes up nice! Btw, sometimes I give away the wee Buck 112 to young lads, as a first fixed blade. But indeed there are better knifes, and for a light folder (and the price) a few of my favorites would be Cold Steel’s Recon 1, and the Broken Skull. *Of course I meant a first type size blade looking like a fixed blade when opened. My youngest son (born in my 40’s), in the Royal Army and a combat medic in the infantry, still carries his Buck 112 as a back-up knife. But that young man can sharpen a blade better than his old man! And btw, he says the Buck lock-blade is still one of the best! I’ve always been interested in the 112, as well as some of the even smaller iterations of the 110 design like the Prince. It sure is a visually appealing design, I can’t deny that. I agree with you re: the better options. I haven’t handled either the Recon 1 or the Broken Skull personally, but they do seem like clear improvements along the same design lines. In particular I’m intrigued by the Broken Skull. I think it weighs just over 3 oz.! I’ve heard and read about a number of folks in the service who carry the 110 or similar knives, with similarly positive experiences. I can see it being a good, reliable back-up knife for sure. The lock on mine is real sloppy, but I didn’t ever feel like it was going to fail on me. And in a way, a little slop makes you feel like the knife is primed to be beaten on – at least, that’s how I feel anyway, and I didn’t have any compunction about hammering on my 110 out on hikes. Yes, we are just all knife guys eh! 😉 I know I was raised such, and still am! My father and uncles were all WW II Vet’s… (they are all before the Throne of God now). And yes, I have a few 112’s, and I like the newer one with the finger grooves! I have the gray Broken Skull (Steve Austin), and it is thin and very light, but with a “4 clip blade. Just a sweet blade to carry! Speaking of the 112, I think my one Army son just likes it small but with the rugged feel? But he also has the larger Spyderco Military. Those medics or what we called corpsman love knives! I am too just an old Marine (RMC), and retired. Of course we had (and I still have mine), the British Commando blade and knife. It was just a killer! Definitely Robert! It’s a rabbit hole. I totally get the small/rugged thing. As a civilian surburbanite I don’t need super tough knives, but I definitely enjoy them. If the 112 retains the durability of the 110 in a lighter package, I’ll have to look into it at some point. Don’t know if I’m brave enough to give the finger groove model a try, but they do look pretty cool. Man, Buck should throw a clip and a thumb stud onto the 112. Then we’d really be cooking with gas. The Broken Skull and the American Lawman are two Cold Steel knives I’ve had my eyes on for a long time. Both are definitely modern descendants of the Buck 110: larger, all-purpose, hard use folding knives. It’s only a matter of time before both of these knives end up in my hands, but talking about them here has moved them up a couple places on the (always growing) list! I would definitely recommend the Lawman, though I wish it had another half so-called inch. And old Buck, I just think they will roll along with the 110 and the 112, though I have a rather new 112 with the finger grooves, and I like it! But again, the Broken Skull is well worth it, but not sure how long Cold Steel will keep it? Yep, I agree, Buck will probably just keep on keeping on, making what they make and not really caring about staying with the times. I can appreciate that. There’s plenty of modern design elsewhere in the knife world, and if they started making a bunch of great new designs right now I’d have an even harder time keeping up with all the good knives than I do now. Hi Ben. An interesting note about the 110: Back when it was “the” folding knife to have, especially for self defense purposes, you could find a lot of one-handed opening devices like the “flick it” at gun and knife shows. I think they sell something similar at bladehq these days. Obviously still not as good as a delica, but might be fun to have if you want the full 110 experience. Yeah, I’ve seen a few such things, and was definitely tempted. I think one of the early ones was called the “One-Armed Bandit,” a sort of hooped thumbstud that fit over the top of the knife. If I stumble across one somewhere I might just pick it up for fun. Relatedly, I’m kind of surprised there isn’t a bigger mod scene for 110s than there is. I’ve also heard that people modded their 110 somehow so that it was loose enough to just wrist flick open. Not sure how that worked though. I have an older 110 (Buck U.S.A. 1972?) that I lathed and polished down the handle so I could open it with one hand. It is still nice to use, and the blade still sharpens well and quickly! *I have had people ask me to do theirs, and I have done just a few. It does make the knife handle obviously smaller. I’ve never been a huge fan of the 110 but i sure wouldn’t mind having a $5 bill for every animal that’s been cleaned using a 110 over the years that’s for sure.I never could get use to it’s size and bulk and prefer the 112 or even the much smaller model 55 over it.The best all-around Buck folder i’ve ever owned and used is without question the Marksman which i feel is one of the best tactical style folders available for under $90..The Marksman is a very underrated folder.I’ve had my eye on the Broken Skull and have noticed how similiar it is to that of the Lone Star folder.I usually avoid celebrity endorsed knives like the plague because most are way overpriced simply because of who’s name is attached to them,but in the case of the BS it looks to be a legit folder ,made from good materials,and at a fair asking price,but it does look like an upgraded version of the LS just with a celebrity name associated with it. The 55 seems like a great option for somebody interested in the 110 styling but not interested in its weight. At that size I have to assume it feels, carries, and functions more like a traditional knife. I haven’t had a chance to handle a Marksman but I’ve heard nothing but good things, from Dan and others. I do think it is the only genuinely interesting design Buck has made since the Vantage. I’m with you, I think the Broken Skull was probably already in the works when Cold Steel approached Steve Austin and asked for a partnership. They have been upgrading a lot of old designs and the Lone Star was due for a makeover. And while I don’t like celebrity knives either, at the very least Steve Austin does seem to be genuinely into knives. I saw a video of Austin where he whipped out a Sebenza and talked about opening up bottles with it. I think one of the biggest advantages the 110 and its kin has it that they’re not stigmatized like many other knives. We here all know that a knife is a tool, but to many of the inexperienced or uninformed in the world, certain types of knives are thought of as a criminal’s weapon (stilettos, balisongs) or killing tools (anything that looks too “tactical”). Old style designs like Buck, Case, etc usually don’t generate such immediate negative reactions. I have noticed that I can carry my 110 in its leather case on my belt in plain view, and nobody bats an eye. On the other hand I’ve seen plenty of people starring at my pockets with a more modern knife clipped to them. I’m not in any way suggesting anyone give up their Benchmade or Kershaw or whatever, but pointing out that in certain situations it may be practical to carry the knife that will draw less attention as opposed to perhaps no knife at all. This is a great point, and one that I am coming increasingly to appreciate. The old style trappings of traditional knives and the Buck 110 just put people at ease in a way that modern knives don’t. And people-friendliness is a big plus for me personally, just because I’m around so many non-knife people, and while I don’t share their anxieties regarding knives, I can definitely sympathize and don’t want to make them uncomfortable. I will say though that people in my current neck of the woods would probably be a little weirded out by the 110, less because of the way it looks than its overall size. But when I was living in Colorado I saw more than one guy with a 110 belt pouch out and about, and nobody gave it a second glance. Drawing less attention is almost always a good thing. One reason (among many) I don’t like flippers is that the are so ostentatious; everybody around you knows you’re deploying a knife, and to the uninitiated it looks like you’re flipping out a weapon. Even thumb studs/deployment holes give you the option of slow-rolling, but with a flipper you have to be fast and you have to be loud. Nail nicks are the anti-flipper in this respect, and I appreciate that. The Buck 110 is an excellent knife for its intended niche. That is a heavy use, folding, outdoor knife. It is not a pocket knife. It is not designed for fine cutting chores. It is designed to perform heavy cutting chores while being more compact than a fixed blade knife with a 4″ blade. And, in this regard it is a fine fit. The biggest problem with this knife is that people attempt to compare it to knives which are outside the niche for which the Buck 110 was designed. Many of the lighter knives, to which the 110 is compared, are far more convenient to carry. They will also handle the light, daily cutting chores, such as box opening and string cutting, as well or better than the 110. But, when it comes to moderate to heavy field chores, they handle these chores less well than the 110. The 110 is not necessarily the best choice for EDC in an urban, or modern suburban, environment. I have two 110s, which I purchased in the late 1970s. One I carried for 20 years in law enforcement. It has been used for everything from slipping door locks, to light prying, to cutting seatbelts, to cutting heavy rope and even some electrical wire [not something that I would suggest]. The blade width has been reduced by about 10-15%, due to repeated sharpening. But, the lockup is still tight, the edge sharp and the handle in good condition. I no longer carry this knife, except when I am out in the woods and do not wish to carry a fixed blade knife. Like others, I carry one of the lighter pocket clip equipped 4″ folders and a smaller Swiss Army knife for fine cutting jobs. As noted it is bulky and heavy and is not needed for most daily cutting chores. However, it is a good replacement for a a fixed blade defensive knife for EDC in urban and suburban environments. It can be carried in a pocket. It is more robust than most lighter folders and, if it is used defensively, it is less likely to arouse undesired questions than a fixed blade knife or “tactical folding knife” would. The desirability of a knife depends almost entirely upon the uses one envisions for the knife. If one is going to use the knife for heavy-duty cutting chores, then a heavy knife is probably a better choice than a light one. And, the Buck 110 provides heavy-duty use for a remarkably low price. Thanks for this great comment. The insight and experience is much appreciated. I’ve always wondered how something this knife would hold up over time and it sounds like the 110 will wear like iron. You’re right, I think people have a tendency to want the 110 to be something other than what it is – myself included. For the price, you are certainly getting a durable outdoors/heavy duty knife. I still think that there are some better knives – even in those roles – right around the same price, but I see and agree with your point. The 110 works best as an outdoors/hard use tool, not an EDC. I love Buck but my custom 110 is the worst Buck knife I own. It is very good looking and sure it will last but the fold is so rough that it needs to be pushed home. I did ask for advice but was told to hit it on something hard! Not what I expected from Buck. That is interesting to hear – I’ve always wondered what the knives from Buck’s custom shop are like in terms of quality. I’m sure they’ve produced nice ones but it’s too bad yours came out so rough. Sometimes the 110’s good looks work against it, I think – it’s so handsome that you expect its fit and finish to be as striking as its looks, but Buck just doesn’t seem capable of (or, more likely, just isn’t interested in) consistent, high FnF. But yeah, they may be shoddily put together but they will definitely last a long time, so there’s that. 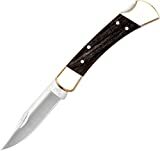 I was born in the late 50’s, and my first good knife as a kid was a Buck 110. I followed that up a while later with a model 120 (General). Those were gentler times and a kid with a ridiculously long-bladed sheath knife drew chuckles and good natured jokes from adults, but nobody seemed to think the kid would grow up to be a serial killer or something. Some years later, the 110 was stolen, and I moved on to newer, spiffier knives and was without a 110 for years. A couple of years ago, I bought a new 110. The price was so reasonable, I just bought it to have one again. The knife’s arrival, however, stirred old memories. My first 110 had blockier bolsters, but the overall feel in the hand was like coming home. I’ve since bought a couple of custom 110’s – S30v blade steel, drop point, and the traditional clip point too. Lochsa folder has factory thumbs tubs and clip on the handle. An aluminum-framed 110 weighs in at 4 1/8 oz. Ultimately, Buck keeps this traditional best-seller around because it is a still viable living link to the past, it makes them a lot of money, and acts as a gateway drug to a steel adiction. If Ford still made the Model A, they would still sell too. For many of us, geezers and non-geezers alike, the 110 is a trustworthy, known quantity. Who wouldn’t want that for adventuring, whether into the backwoods, or the back yard? Thanks for sharing – I think you hit it on the head: the 110 is living piece of knife history: few blades have the years behind them, and rekindle the memories that the 110 does. I take issue with some of its quirks but I definitely don’t want to see it disappear. I had heard of the Lochsa before but couldn’t cough up the kind of cash they wanted for that one. But I had never heard of this aluminum framed model before – if I ever pick up another modern 110 this will be the one I look for, thanks for bringing it to my attention. However, before I get another current generation 110, I might try and look for one from the golden years. I’ve heard they’re a little better in terms of quality and steel. A fair review, Benjamin, thanks. I know that there are numerous knives “better” than my old Buck 110 (by modern standards), but I carry it anyway, keep it very clean and sharp, and trust it, in spite of its faults. My brother purchased this knife just after he earned his Green Beret in 1967. Took it with him to Vietnam. It came home with his effects, and I claimed it for my own. In 1972 I carried it back to Vietnam with me. It fought with A-341 in the battle of Bu Dop, then flew 64 combat reconnaissance missions and “lived” through the final big battle of the war, Linebacker II. It may be old and outdated, but here ain’t many folders that can claim a history like that. This is an amazing story, thanks so much for sharing. The history and lineage of the Buck 110 is something that no other modern folder can match. A lot of knives we think of as “old” like the Sebenza or the Delica are babies compared with it – and even though sentimentality plays a role in why the 110 continues to sell, more importantly it’s also a strong, reliable blade. As yours and other comments have shown, it has a deeply proven track record. Well. I live in Canada where it’s legal to carry knives but most people don’t….being from the prairies and growing up in the country I’m just used to carrying a blade…..I do notice people get uncomfortable when i have one of my Grohmanns on my belt, but no one even cares or notices when I have my Buck in it’s sheath….I have some good modern folders but they’re so light I always seem to be looking for them…not so with my Bucks ( I have a 110 and a 112 ) and I don’t mind the weight…..I know it’s there…..as for the sloppiness some of you mention, I buy mine at a local gun shop and try them out before I leave the store…..just like all my guitars, I would never buy a guitar unseen or untried, so why would i do that with a tool like a knife, duh?! There are advantages to the heft, I know what you mean. It makes it easier to know if the knife is there for one, and it definitely imparts confidence too. I’m sure more modern designs at half the weight or less are theoretically as (if not more) durable than the 110, but the weight makes me feel like it the 110 is stronger. And there’s something to be said for that. And sheath carry negates a lot of the weight problem if you’re comfortable with that style of stowage. As for the slop, I have to say that every Buck I’ve handled has exhibited it in some form or other. I’m sure there are better ones out there but I’ve yet to see one in person. I can order from other manufacturers online confident that I’ll receive a well-tuned unit 99% of the time; I would like to see Buck hit that reliability as well. But yeah, definitely no better way to get a good one than to inspect it yourself. Excellent review, Benjamin, and interesting reader comments and testimonials on the classic 110. I received my first 110 as a gift back in ’69-70 as a young lad, and it served me well and faithfully through Boy Scouts, regular hunting/fishing/backpacking/camping trips and then 10 years active-duty Air Force on numerous global assignments and deployments – I “never left home without it”. I’ve acquired several more lighter, technically-advanced tactical folders over the years, but in 2014 my original 110 was stolen, and I was devastated – not so much that I didn’t have several other better, lighter, advanced folders at my disposal, but simply that my trusty, old 110 was gone! My wife surprised me with a new 110 as a stocking-stuffer this Christmas, no, not the same as my original 110, but just incredibly comforting to have a clunky, new and beautiful 110 again! Maybe you could say it’s simply a traditional, state-of-mind thing for us Buck 110 loyalists? Thanks for your review. Thanks for the kind words! I agree, the comments on this review are my favorite to read; there are so many great 110 stories and memories out there, and you’ve just added one here yourself. There’s something to be said for “trusting” a knife. I feel that way about my good old saber grind Delica 4. It’s definitely not the “best” knife in my collection in the sense of mechanical or technological advancement, but it’s the one I trust the most to do whatever I need, whenever I need it to. It travels with me and never lets me down. It sounds like you had a similar relationship with that first 110 of yours. It’s a shame you lost it but I’m glad you’re enjoying the new one. For all of my complaining in the review I guess I’m glad that the 110 has kind of stayed it’s same old beautiful and clunky self, too. Dunno if you’ve seen yet but Buck is bringing out a lightweight FRN-handled model that weighs under 3 oz. next year! Great idea and I’d be interested in trying it out, but for me it lacks that classic 110 feel (visually, at least). Maybe I’m more in that 110 state of mind than I thought? I’ve been carrying a Buck 110 or Schrade Old Timer 7OT on my belt seven days a week, twelve months a year, for over 40 years. I do not notice the weight. My will states that I want a Buck 110 on my belt, and a Buck 301, and 389 in my pocket when they close that box. Walmart has the Buck 110 (yes, still made in Post Falls, Idaho) with an every day not on sale price of under $30. Of the six I have (four bought at Walmart) only one had any blade play, and that was when it was closed. Padded pliers fixed that problem. I have NEVER had a 110 with blade rock when it was open. Their SPA Treatment refurbishes any of their knives making it look new, for less than $10. Want an upgraded steel, different scales? Not a problem. The Buck Custom Shop (currently) offers an S30V blade option. (They also offer a choice of clip point or drop point blades.) G-10 is one of the optional handle materials. S&K has a SFO 110 with aluminum bolsters, and micarta scales. It does not have a pocket clip or one hand opening. A backlock or locking blade do not a “modern” knife make. Locking blades (both back lock and liner lock, along with button locks, lever locks, and other means) were known in the 1800’s, after all. I’ve heard nothing but good things about Buck’s warranty. If I carried my 110 more often I might consider sending it in for a tune-up, but the issues I note in my review, although annoying, don’t seem to be problematic in any serious sense. The fact that the 110 is so cheap is impressive. I still don’t think it’s the most practical knife you can buy for that amount of money, but there’s no denying you get ‘a lot,’ in more ways than one, for what you pay. I’m still looking for a pristine, early era 110 at a reasonable price. They usually hover around $60-70 on the secondary, which is hard for me to choke up for something I will carry only occasionally. I’m still hoping I’ll stumble onto a pristine and forgotten one at a thrift store or flea market. I gotta disagree with the “traditional” label on the 110, though. It straddles the border but I still maintain that the 110 marked a pretty big shift in what knives really could be, and for that reason I still think of it as the first “modern” folder. Seems like all the “expert” reviewers love to shoot down an old warhorse and/or workhorse using the approved verbiage. I read knife and gun reviews and wonder how our fathers and grandfathers ever won at war, brought home the venison, or did any chores on the farm given the poor tools with which they were forced to work. That was sarcasm, in case anyone missed it. Reading gun and knife reviews nowadays is a lot like reading a critic’s review of a movie: they usually seem more about the reviewers demonstrating how cleverly they can explain what makes a good movie/gun/knife using “teck speak” vs. whatever’s being reviewed. The author’s review here of the Buck 110 sounds a lot like reviews of the M1 .30 Carbine. According to reviews by ‘smart people’, the M1 Carbine was an underpowered carbine (and thus “not really a true rifle”) with a too loud muzzle blast, poor sights, etc. Sort of like a too heavy, poorly balanced folding knife with shoddy lockwork and mediocre steel. Thus, they struggle to understand why they were/are so damned popular with the guys who carried them. Perhaps the hoi poloi are too busy scratching fleas to read finely crafted eviscerations by “experts” of the movies, guns and knives they like and don’t realize they’re carrying junk…or maybe The Terminator, M1 Carbines, and Buck 110’s possess a je ne sais quoi that transcends any “expert” reviewer’s opnion. Charles, I don’t see how Ben can, in good conscious, compare this knife favorably to a modern EDC knife. That’s not to say that the 110 is a bad knife. It’s iconic and can certainly get the job done, but compared with modern knives it doesn’t stand up in an apples to apples comparison. Perhaps that is unfair as the 110 is practically an antique, but it’s Ben’s honest take on the knife. What else can you ask for from a reviewer? He doesn’t hold himself out as an expert. He’s just a man with an opinion, and I think he showed the 110 plenty of deference. Please don’t take his critique of the knife personally. I’ll second Dan and point out that I’m no knife expert, and am only rendering an opinion, not a universal verdict that everyone must adhere to. I understand why the 110 was popular, and to a large extent understand why it remains so; people love a classic, and not every purchase has to be based on a cold rendering and weighing of objective information. I have no reason to ever carry it, and haven’t since the review, but I’ve kept my 110; it’s remained in the collection even as better knives have come and go, because I just like it. You wrote that Buck “…customers are left in the lurch by some very shoddy production”. That’s quite a damning condemnation. Care to try and validate that? There are many varied opinions about the 110, and no, it doesn’t compare favorably with many modern folders. It’s heavy, often requires two hands to open safely, and has a fine tip that is prone to breakage if mis-used. But most of those modern wonder-knives we laud so much are basically standing on the shoulders of the 110. It was the first truly viable lock blade knife of the modern era, and it’s multi-million unit sales attest to its ability to get the job done. Additionally, there are a few more points that make the 110 a stand-out in a world now chock-a-block with also-rans. 1. Economy, I have purchased four 110’s as gifts or to drop in this bag or that briefcase or stow in that center console. Each time I walked out of the store having paid less than $30. The 110 is a very capable knife that has an easy entry cost. 2. Quality of steel, many may be scratching their heads over this. How can you praise a budget steel like 420? It’s all in the heat treat. If you don’t think Bos’s 420 is anything to write home about, remember that in informal cut tests (Cedric and Ada) Buck’s 420 retains an edge about 50% longer than another 420. If you have used one much, you have probably observed the better edge retention first-hand. 3. Made in America, if you don’t get this yet, you probably won’t until you have been unemployed. 4. Nostalgia, the 110 was the first “good knife” millions of outdoorsmen ever owned (I’m one of them). They have proved reliable in millions of hands and on millions of belts for decades. Maybe your dream car is not a split window Corvette with a 427; maybe you don’t understand why Mohammed Ali was the greatest “boxer” to ever win the Heavyweight title, but for millions, there is a special place for this classic that will not fade with time. 5. Legal precedent, here in the People’s Republic of Maryland, knife carry law is inseperably linked to the 110. A Maryland man won his Court fight when he was accused of carrying an illegal blade (his Buck 110). The Court found in the 110 owner’s favor, helping establish decades of more-rational-than-normal legislation for the knife carrying public in Maryland. 6. Variety, if you don’t like the 110 for whatever reason, fine, cheers! But don’t expect Buck to drop a perennial favorite while it still sells like house on fire, and don’t assume that everyone who carries and regularly uses a 110 just doesn’t understand knives and the 110’s limitations. To each his own. It may also be that at times, we should avoid judging other people’s abilities or knowledge by our own limitations. Warm regards, and long live this golden age of cutlery we are currently enjoying. Well said. And what you didn’t say was anything about anyone ever having complained that “customers are left in the lurch by some very shoddy production” per the review. That’s a very strong condemnation and I think uncalled for. Can you provide a link or other reference for the Maryland case? Tragically, I hve recently been declared a member of a heretofore unheard of (by me) demographic, “advanced middle age”. My recollection (bear the above in mind) is that the brief case history can be found on a site named U.S. Knife Laws, or something along those lines, or simply by entering “knife laws for Maryland” on that modern oracle, Google. totally disagree with this review but respect it. comparing Apple’s and oranges. The locking mechanism is very solid. much better than liner locks and frame locks. there are tons of videos proving this and bucks lockback is one of the best. The little bit of play is totally acceptable. this is not a pocket knife so not fair to expect it to be carried like one. it comes with a sheath for a reason. it’s not advertised as an EDC knife either. buck makes plenty of models to satisfy every need and the 110 fits a perfect need for millions of people. there is a reason it’s been around for almost 60 years and copied by others. it’s one the best looking knives as well as functional. I have over 15 of these from every decade and been using and carying one since the 70’s. if I need a pocket knife out comes my victorinox. I’m one of those crazy people that carried this knife on me every working day of my 20+ years in the Coast Guard, along with a whole bunch of other Coasties and Navy personnel, it was a tool you could depend on to save your life and the lives of others. It was a pry bar, a can opener, a screw driver, hammer, whatever was necessary to get the job done, and all this while drenched in saltwater and little to no maintenance. It’s much more than an iconic knife. Spencer, It has been fascinating to read the comments on this review. Frankly I have been surprised to see how attached people are to this knife. Very cool. I hope yours continues to provide many years of faithful service.